is that automation applied to an efficient operation will magnify the efficiency. There was a time, when building cars relied on delivering each frame to the workers for continuing the manufacturing process by horse-drawn carriages. 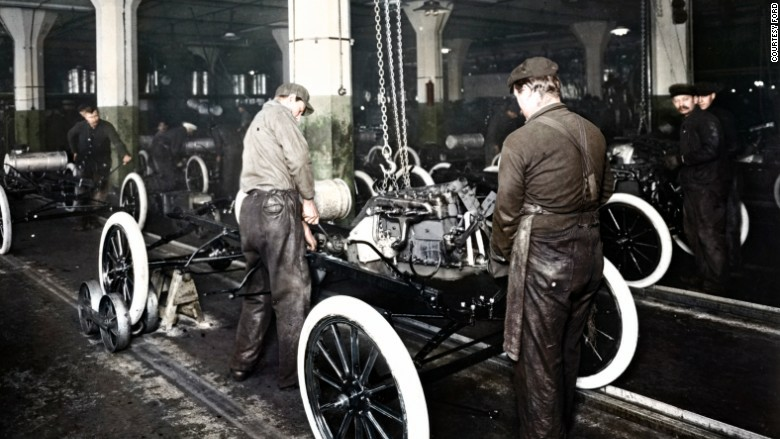 In order to make car production more efficient, Henry Ford invented the first moving assembly line in industry, which is a fundamental part of car manufacturing all over the world today. In synthetic biology engineering principles like standardization, decoupling and abstraction enable the construction of biological system with new, non-natural functions (Endy 2005) with applications in biomedical (Paddon and Keasling 2014) (Li et al. 2018) , agriculture (Boehm et al. 2017) and biotechnological industry (Erickson et al. 2012) . Nevertheless, several challenges, such as managing biological complexity, unreliable construction of synthetic biological systems, variation in the behavior and evolution of these systems have to be overcome to establish synthetic biology as an engineering discipline. But how could we overcome these engineering challenges? One possible solution would be to learn from past lessons, when engineering disciplines, which have changed our world tremendously, emerged from natural science like physics and chemistry. But could we adapt these ideas from e.g. mechanical engineering to synthetic biology in a useful way? One example from past lesson is the manufacturing of cars. 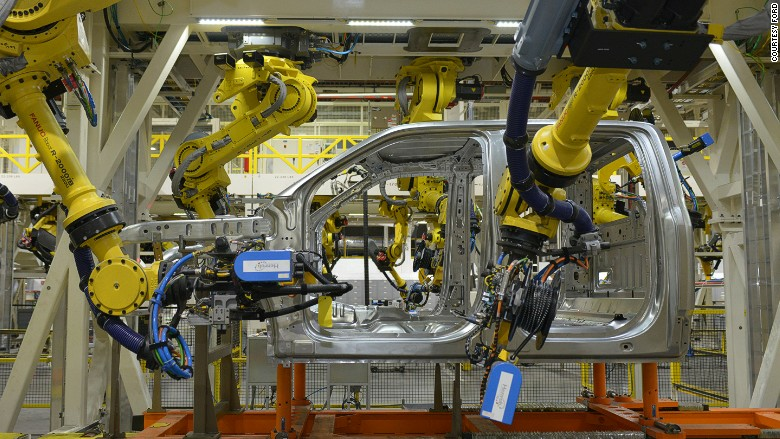 Figure 1: Rise of the robots: The evolution of Ford's assembly line By Sheena McKenzie, for CNN, April 29, 2015. Since the invention of the first moving assembly line in 1913, automation and utilizing robots found their way into car factory’s and have accelerated the process of cars production so that every 4 seconds a ford is built somewhere in the world. What can we learn from building cars more efficient for making biology easier to engineer? When we started our project, we tried to identify the most time-consuming step in synthetic biology and came to the conclusion that the waiting time for the growth of the chassis is one of the biggest drawbacks, which has to be overcome to accelerate the design, build and test process for engineering biological systems. But if you would transfer that to our car production analogy, it would be the same as exchanging all workers but sticking to all old and slow machines in the factory without all the automation, which has taken place. Only the combination with robots and an assembly line for production has led to the highly improved efficiency. 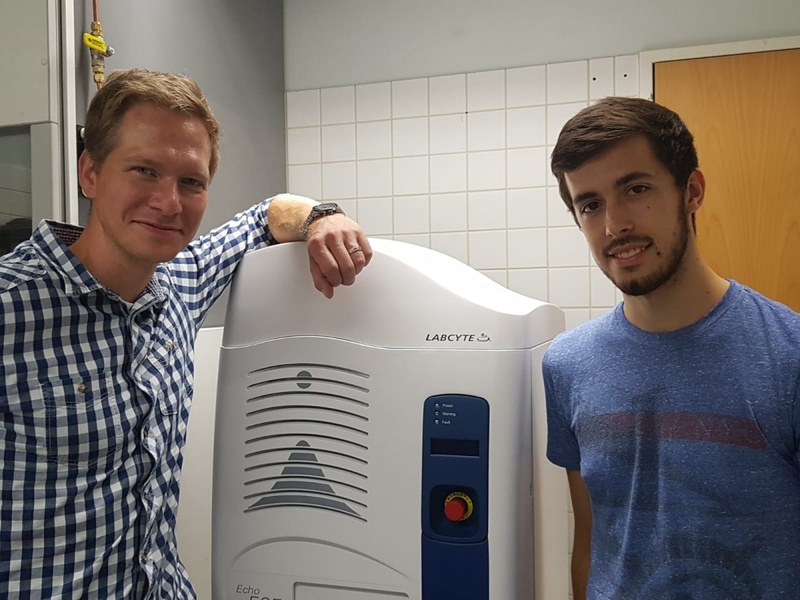 Inspired by this idea, we set our goal to combine our project of establishing the fastest organism in the world with state-of-the-art lab automation and lab technology and reached out to several companies. The first step was to find a PCR cycler with the fastest ramp rate (heating/cooling per second) and we came across an application note (Nils Gerke and Arora Phang 2017) where different PCR cyclers were compared in terms of runtime. Here it was reported that the Mastercycler X50s from Eppendorf has the fastest ramp rate of 10°C/Sec and we contacted Eppendorf and luckily, they provided us the cycler for the time of this year’s competition and we were able to test the fast performance for our PCR applications. 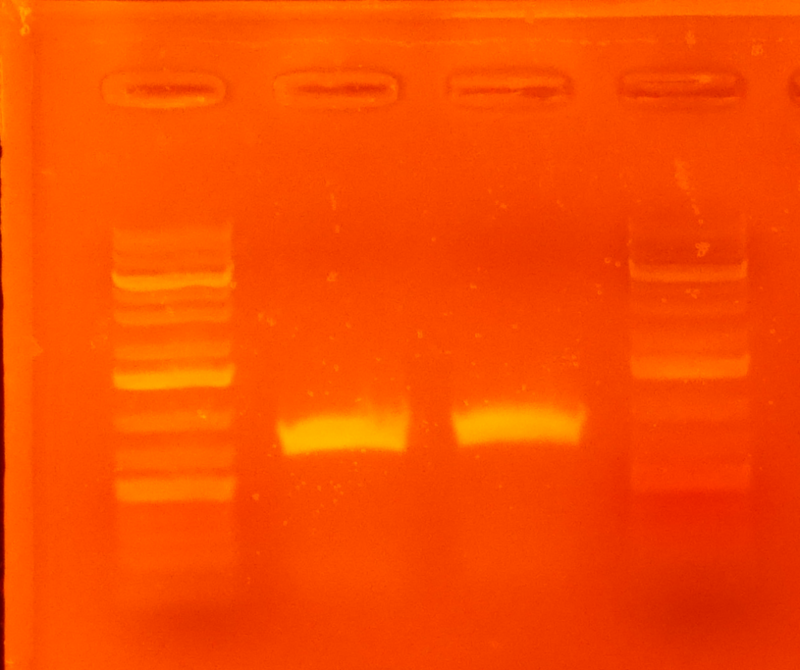 Therefore, we established a protocol for fast PCR´s in order to speed up the cloning process and develop a fast and cheap site directed mutagenesis (SDM) workflow. In our hands we were able to perform a complete SDM cloning (point mutation, deletion, insertion) in one day. 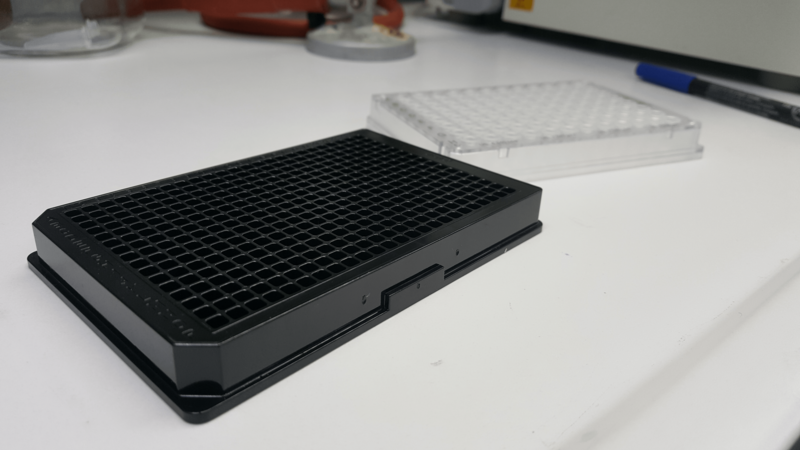 Additionally, the Mastercycler X50s was utilized for high throughput transformation (in 96 well plates), which is critical for other cycler models due to slow ramp rates, which decrease transformation efficiency. 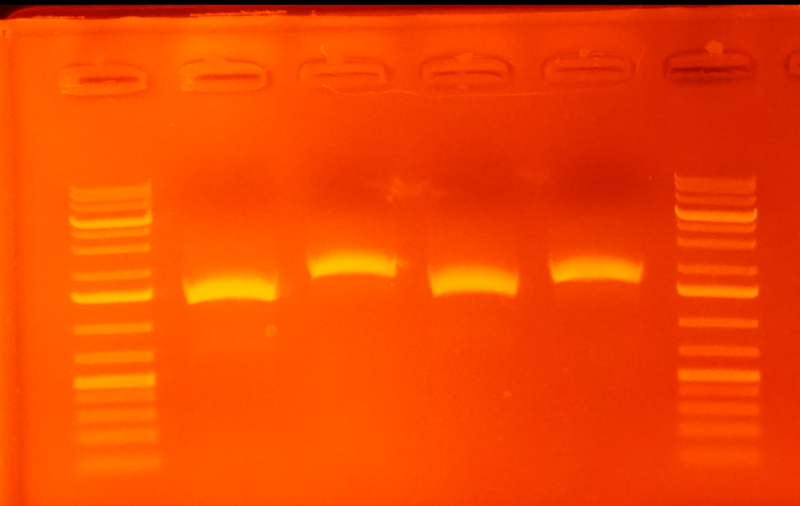 Figure 2: Gel electrophoresis after PCR protocol optimization for 20 min and 16 min protocols. The next step for our accelerated synthetic biology assembly line was bringing in the automation. Therefore, we applied for a free Opentron and were lucky to be provided by a free robot. This allowed us to automate processes like inoculating culture to a defined OD, coping plates and preparing 96 well plate transformations. Additionally, we performed a complete run of the interlab study by utilizing the Opentron robot. Our main achievement was the establishment of an automated golden gate cloning workflow, where we were able to build over 50 plasmids by combining our cloning software tool Click’n’Clone and the pipetting robot. Therefore, we programmed a software interface between our cloning tool and our pipetting scripts. This enables easy and fast plasmid construction, with an extremely high layer of abstraction, where the user does not have to consider lower abstractions levels, which enables more complex synthetic biological designs. When we build all these constructs with the Opentron, we realized that building huge construct libraries is still time consuming even with our automation approach. If we bring back the idea of automation in the car industry, the next step would be to establish a complete assembly pipeline for our workflow. That is why we went back to literature and found a paper on utilizing sound waves for DNA fabrication. 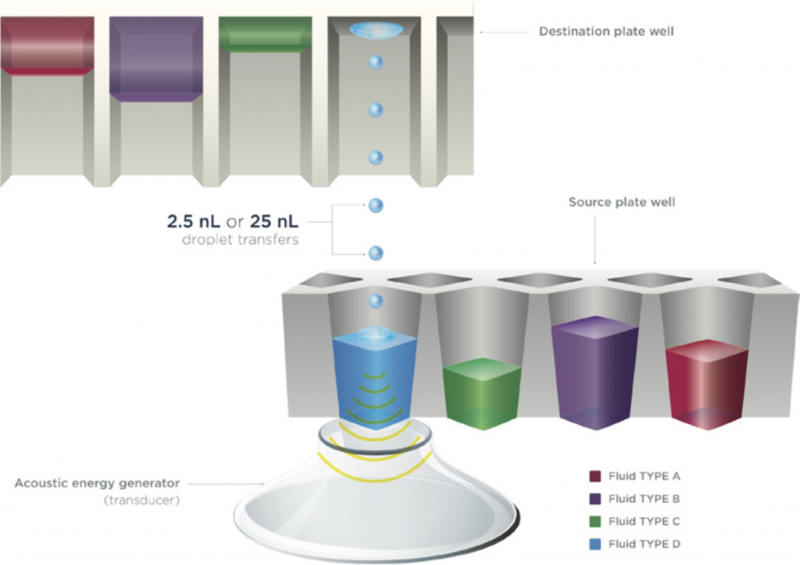 They have shown several down scaled cloning methods, where the pipetting process is replaced by acoustic droplet liquid handling via Echo devices. Nanoliter-scale liquid droplets can be transferred with high precision and accuracy by utilizing acoustic droplet ejection technology. This method minimizes the costs of reagents and consumables, due to noncontact, tipless, low-volume nature of this liquid handling approach. They could successfully downscale PCRs and cloning methods, such as Golden Gate and Gibson assemblies to the nanoliter scale and at the same time increasing the assembly efficiency and decreasing the reagent cost by 20- to 100-fold. Figure 4: Inner workings of the Echo. Figure 5: 384 Well plate of the Echo. enable to automate the next step for a fully automated cloning workflow. The next step would be the picking step, and we also had different ideas on that, as some efforts are done to build an open source colony picker by using the Opentron. Unfortunately, we were not able to realize automated colony picking, but this would be an important missing step for the future. 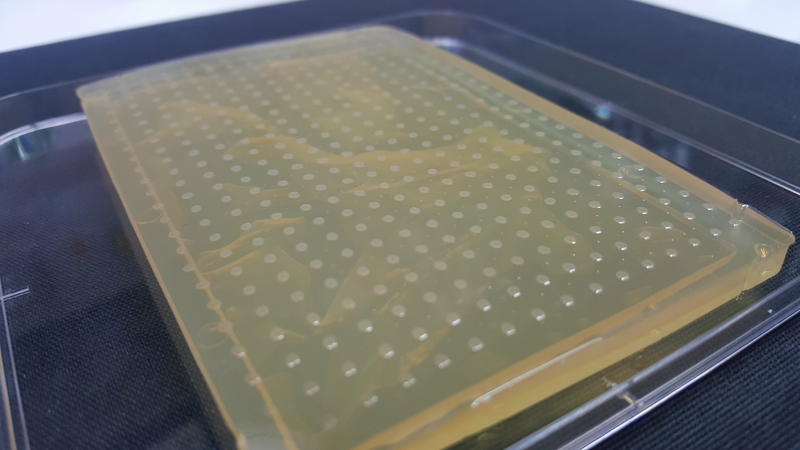 To demonstrate the precision of the Echo for shooting nanoliter droplets, we came up with the idea of printing our team logo on an agar plate with Vibrio Natriegens, what turned out successfully. 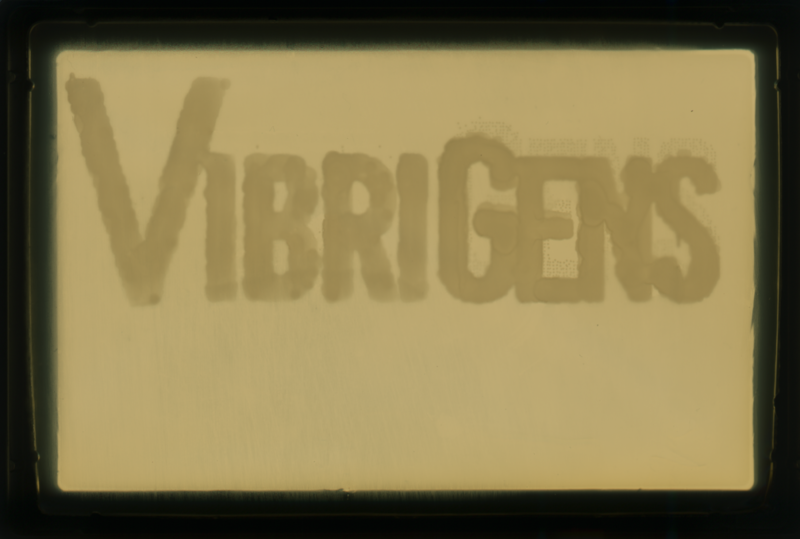 Figure 6: Vibrigens Logo plated with the Echo. When we started with the idea of getting an Echo for our automation pipeline, our expectations were high in terms of how fast the Echo is in transferring combinatorial liquid handling tasks. But when we saw it the first time with our own eyes, all of us were incredibly impressed and our expectations were completely exceeded. We set up a test run of nearly 1000 transitions steps and after 3 minutes the run was done and the 96 well plate was filled with 8 part- golden gate reactions. After establishing automation for the key methods of our cloning process we designed our main high throughput experiment. For that we used our metabolic engineering project as a proof of concept for our automation pipeline by building up a library for our synthetic metabolic pathway, where the expression levels are fine tuned by vary different promotor and RBS strength. In order to create all the pipetting scripts for the Echo, we wrote our own software viaMatlab, due to the fact that it would be impossible to write a picking list (10 pipetting steps for each plasmid x 1446) by hand. Moreover, we were able to write an interface for our Click`n`Clone software, which enables easy plasmid construction by the Echo via a graphical user interface. Figure 7: Graphical user interface for the Echo. In the end we successfully constructed a library of 1446 variants of our pathway (link metabolic design). Constructing a library of this size would not have been possible without using the Echo, which is to our knowledge the fastest method for combinatorial, low volume liquid handling, as it needed for molecular cloning applications. After setting up the picking list we prepared our complete Marburg toolbox on a 384-well plate as a source plate for the Echo by establishing protocols for 384 well plates for the Opentron. As the number of parts increased over the time of the project, it became more critical to utilize the Opentron for this step, in order to minimize pipetting mistakes, which would lead to severe consequences in the following cloning procedure, especially for pipetting 384 well plates. Figure 8: Black 384 well plate. All in all, we were able to successfully establish an accelerated assembly line for cloning, by combining the fastest growing organism, V. natriegens, with state-of-the-art lab technology and lab automation by utilizing an Opentron pipetting robot and the Echo acoustic liquid handler. We strongly believe that learning from past lessons and adapting ideas from mechanical engineering to synthetic biology could be a solution to overcome the challenges and drawbacks in synthetic biology to make biology an engineering discipline, which does not have to lack behind physics and chemistry. This will definitely include automation lines as it has changed other fields and industries in the past and will hopefully accelerate synthetic biology in the next decades to tackle the biggest challenges the humanity faces. 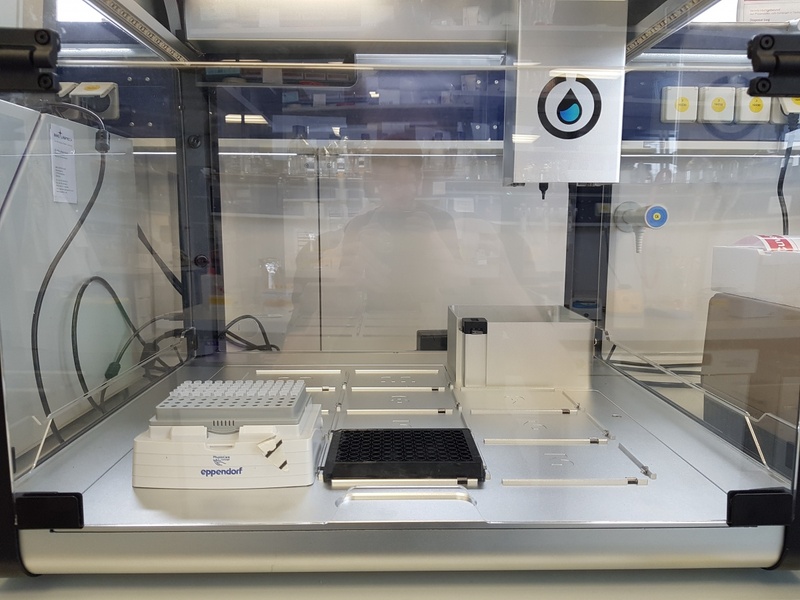 We want to thank again Eppendorf, Opentron and Labcyte, which enabled us to build up our Labautomation project by providing us with their devices for the time of our project. 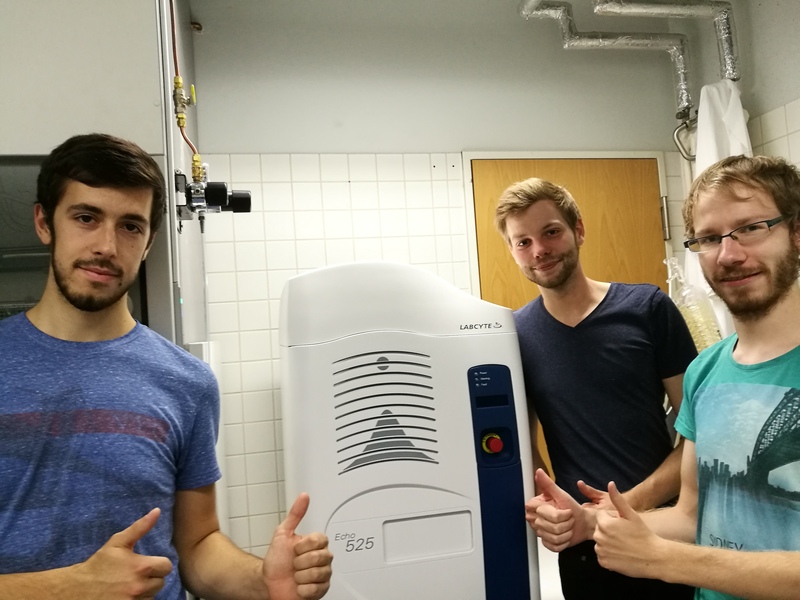 We also have to thank again Dominik Zahr from Labcyte, who helped us during the complete time of our Echo experiments and gave us an insight into what can be done with this amazing acoustic dispenser. Boehm, Christian R.; Pollak, Bernardo; Purswani, Nuri; Patron, Nicola; Haseloff, Jim (2017): Synthetic Botany. In Cold Spring Harbor perspectives in biology 9 (7). DOI: 10.1101/cshperspect.a023887. Endy, Drew (2005): Foundations for engineering biology. In Nature 438 (7067), pp. 449–453. DOI: 10.1038/nature04342. Erickson, Brent; Nelson; Winters, Paul (2012): Perspective on opportunities in industrial biotechnology in renewable chemicals. In Biotechnology journal 7 (2), pp. 176–185. DOI: 10.1002/biot.201100069. Kanigowska, Paulina; Shen, Yue; Zheng, Yijing; Rosser, Susan; Cai, Yizhi (2016): Smart DNA Fabrication Using Sound Waves. Applying Acoustic Dispensing Technologies to Synthetic Biology. In Journal of laboratory automation 21 (1), pp. 49–56. DOI: 10.1177/2211068215593754. Li, Yanran; Li, Sijin; Thodey, Kate; Trenchard, Isis; Cravens, Aaron; Smolke, Christina D. (2018): Complete biosynthesis of noscapine and halogenated alkaloids in yeast. In Proceedings of the National Academy of Sciences of the United States of America 115 (17), E3922-E3931. DOI: 10.1073/pnas.1721469115. Paddon, Chris J.; Keasling, Jay D. (2014): Semi-synthetic artemisinin. A model for the use of synthetic biology in pharmaceutical development. In Nature reviews. Microbiology 12 (5), pp. 355–367. DOI: 10.1038/nrmicro3240.